Florida International University alumna Amira Ajlouni turned recycled materials into a fashion statement again last week. 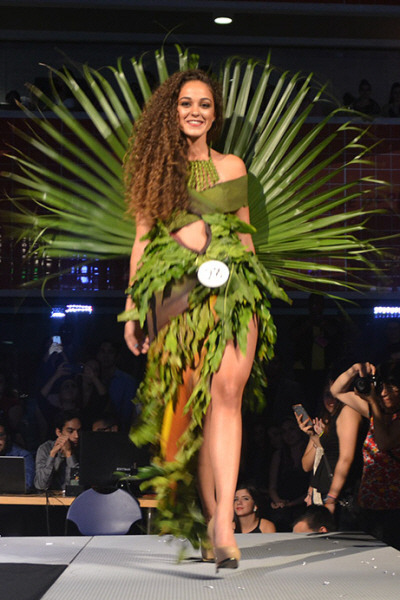 On April 2, she hosted her second annual Eco-Couture Fashion Show in the courtyard at the Paul Cejas Architecture Building, Modesto Maidique Campus, FIU. Eco-Couture was created with the purpose of promoting sustainability through fashion. 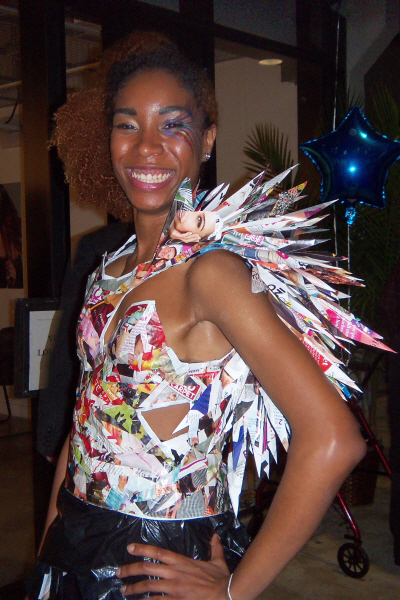 Through collaborative effort from FIU students, the FIU Go Green office and our university’s School of Architecture, we are happy to bring FIU and the community a one of a kind event featuring a recycled fashion show competition, giveaways of recycled projects we have constructed ourselves, and recycled art installations. Amira started the Eco-Couture Fashion Show last year as part of her thesis project. 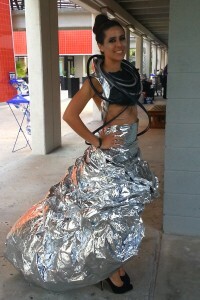 She said that she “wanted people to see recycled materials in a different light . . . I also wanted people to be inspired . . . 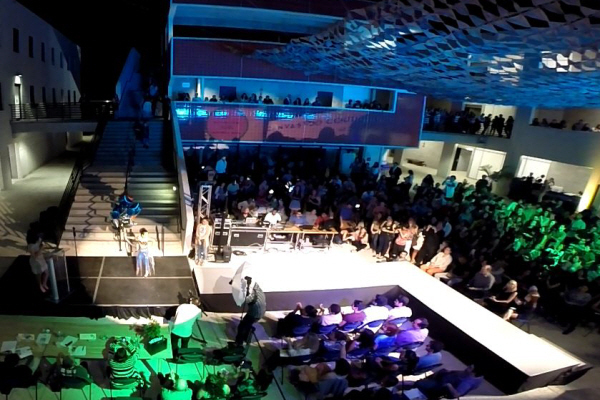 Finally, I wanted to start a tradition.” Amira is now a Junior Architect at Arquitectonica, but teamed up with current FIU Architecture student Jennifer Luis to coordinate this year’s event. 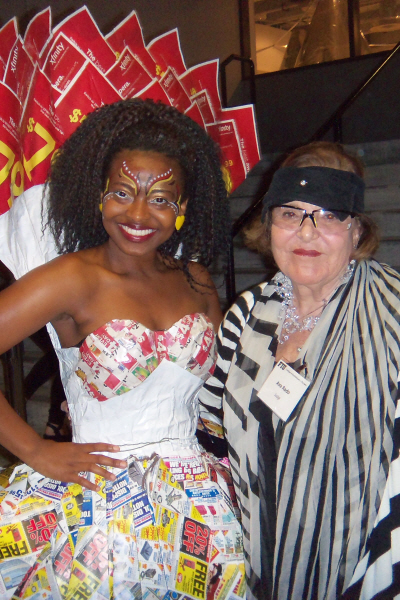 Twenty-eight students spent weeks creating their clothing using only recycled materials, then took to the runway to model in front of more than 300 visitors and 5 judges. 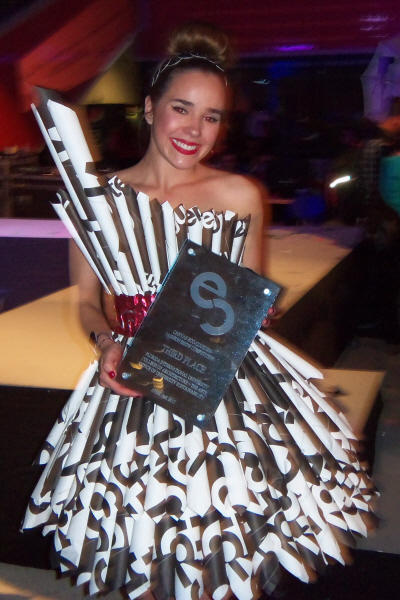 Each outfit was judged on innovation, beauty, craftsmanship and recycled material. The panel of judges included Rene Ruiz, designer/owner of Rene Ruiz Couture; Vanessa Karram, founder of The Sophisticate; Ava Rado, artistic director at the Center for Emerging Art; Constance Silver, artist for Connie McSilver sculptures and creator of FIU’s own “Whoopie”; and Brian Schriner, Dean of the College of Architecture. 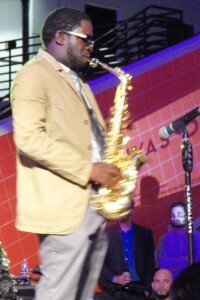 The event was sponsored by the developers of CANVAS, a 37-story residential project in Miami’s Arts & Entertainment District. Other sponsors included FIU College of Architecture, FIU Office of Sustainability, U.S. Green Building Council South Florida, Net Impact South Florida, Recycling Energy Forum, Paradise Key, and Jessenia Gonzalez Photography. Next Article Next Article: Earth Day 2015 – What is Happening in Miami?